I headed up this weekend with a friend for a quick hike along the Nighthawk Trail at Hall Ranch. Within a mile, the red, slippery mud was getting annoying. 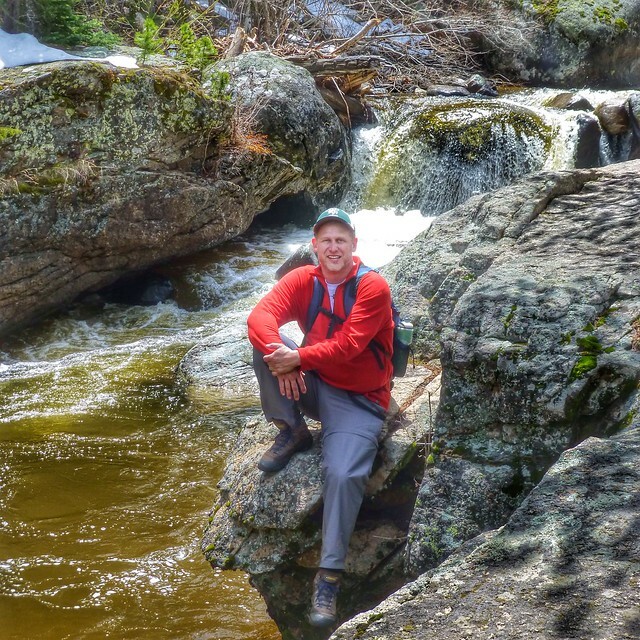 On a whim, I announced that we should turn around and head to Wild Basin in Rocky Mountain National Park. Since we didn’t have much cold weather gear with us, we just decided that if conditions were bad, we would just head up to Estes Park for lunch. We had a great surprise! The Wild Basin area was open and conditions were great. Even better, the gate on the road to the Wild Basin Trailhead was open too! Sadly, the floods from last year did some significant damage to parts of the Wild Basin Trail. 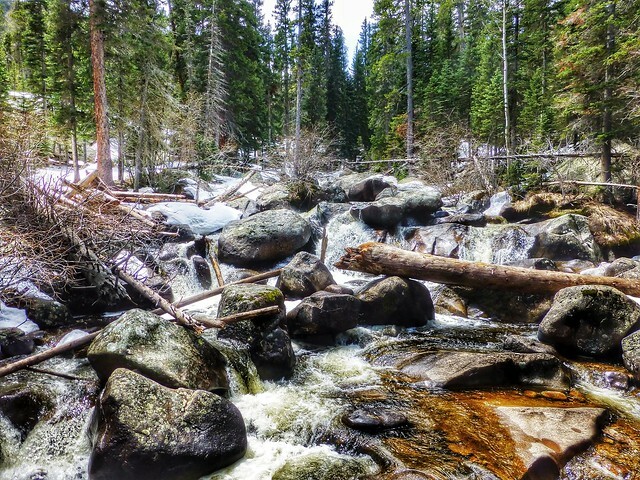 The trail is washed away in some areas, and little but exposed rock and rubble remain. Fortunately, the Park Service is already working on getting the damage repaired, but it may take a little while. We made it to the lower section of Calypso Cascades with little trouble. From the lower section to the bridges closer to the top, the trail was steep and snowpacked. We were able to manage, but it would have been handy to have crampons and/or poles. Even though the distance from the lower bridge to the upper bridge is only 0.4 miles, the difference in the water flow was noticeable. 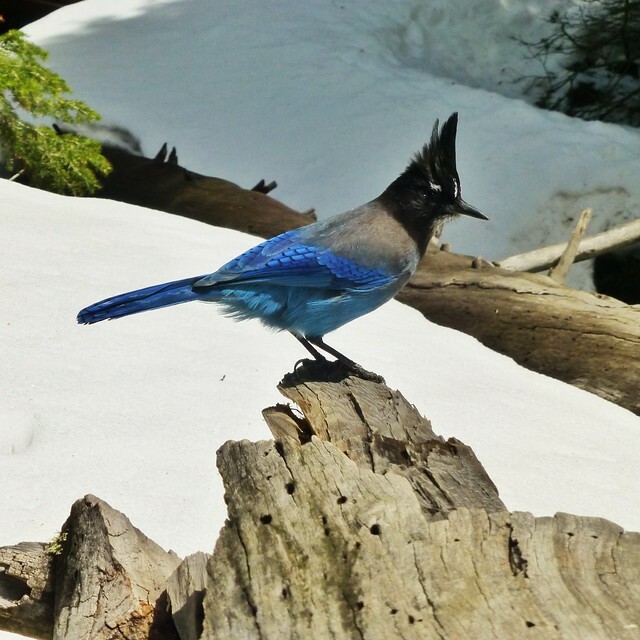 The highlight of the day was the two Steller’s Jays that were hanging out around Calypso Cascades. 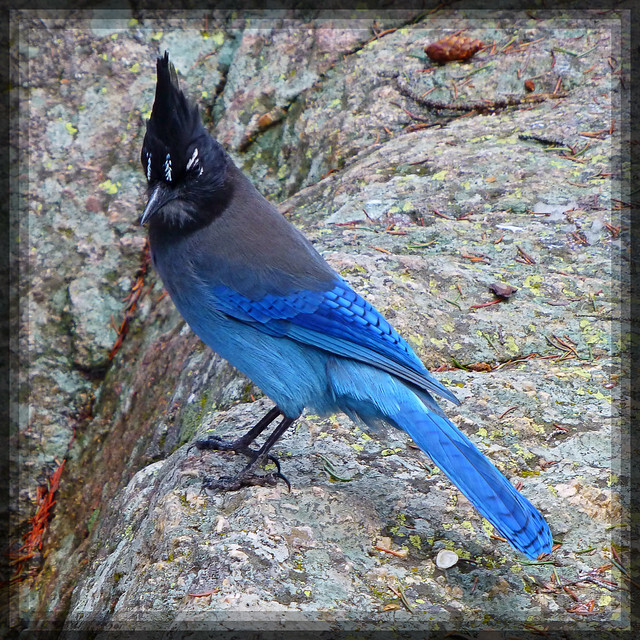 They are beautiful birds that we don’t see that often down on the front range. I was fortunate to have a decent camera with me, and I was able to get some great pictures. Even though we only spent a little more than an hour around the Cascades, the snow was beginning to melt and the trek down was a little slippery. Fortunately, we only had about 0.4 miles and we were back on mostly dry land. Closer to the trail head, we did head over to Copeland Falls. The water flow is still pretty low, but it is an absolutely beautiful setting. It’s also a great place to get your picture taken! While I absolutely love getting up in the mountains, I have to admit that I am a little on the geeky side too. While we were hiking, I touched base with another friend with whom I had planned to head out with in Denver for the evening. It’s rather handy to be able to text via satellite with my Delorme InReach SE. After scolding me for not inviting him hiking, he agreed to meet us at the entrance to Wild Basin. We all headed up to Estes Park and had a wonder Mexican dinner at Casa Grande. 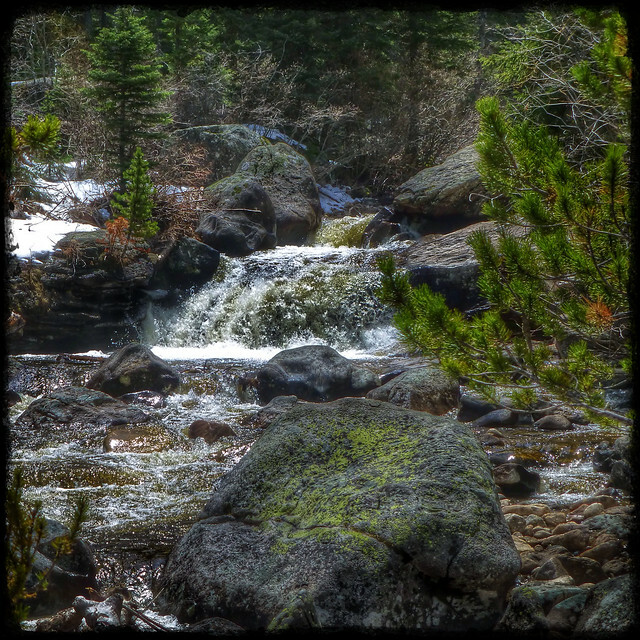 Click HERE to visit my Flickr Album from this hike. 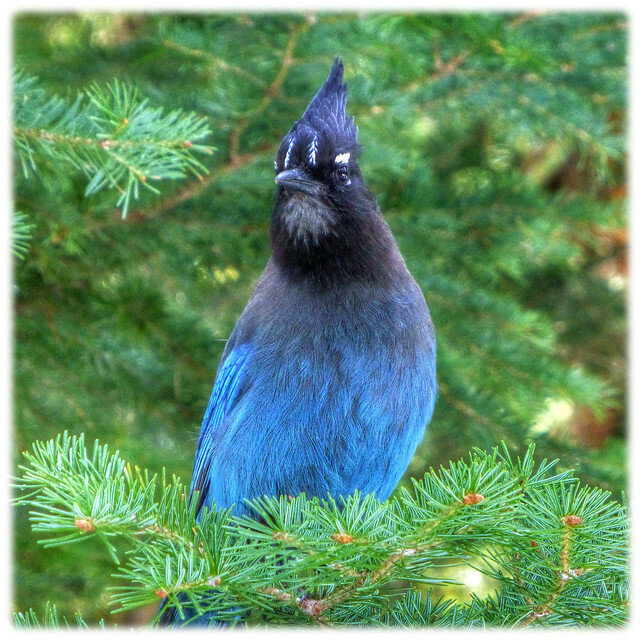 There’s more awesome picture of the Steller’s Jays.